Private-label grocery brands have come a long way since their humble "plain wrap" beginnings in the late 1970s. These brands, including the Kroger (KR) Value line, Wal-Mart's (WMT) Great Value brand and Trader Joe's wide range of self-badged food products, have continued to gain popularity in tough economic times. According to a Nielson report released last week, cash-strapped families looking to cut their food costs have been increasingly eschewing well-known brands for their slightly cheaper counterparts. Private-label brands accounted for 17.4% of the total U.S. dollar share of food products last year, up from 15.2% in 2006, Nielsen says. "Given the recent economic slowdown in developed markets, the value-conscious shopper is more visible across store aisles than ever before," according to the report. "No doubt, this trend will continue even as economies stagger out of the recession and rehabilitate." Store-brand products, which make up a whopping $90 billion industry in the U.S., now account for almost 30% of the total servings of food products sold. That represents a big surge from the period between 1984 and 2003, when their servings market share remained firmly in the 20% range. Back then, it might have been hard to imagine that store brands could attain such heights, as the concept of buying budget brands faced the hurdles of social stigma. 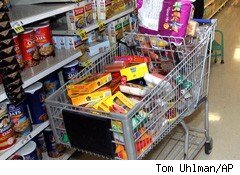 The economy in the last few years has decidedly boosted private-label purchases, but the rise in the popularity of store brands actually began back in the early 2000s -- when the economy was still going strong, but the typical family's purchasing power began to slip, says Harry Balzer, chief industry analyst at NPD Group. While the economy can affect the type of food that gets purchased, it doesn't have a big impact on the amount of food people eat. "There will never be a recession in eating; there will just be winners and losers," Balzer says. "But we will never let food costs rise faster than our income." The concept of private-label brands began more than three decades ago, when Ralphs, a California supermarket chain now owned by Kroger, launched its Plain Wrap brand with about two dozen products aimed at budget-minded customers back in 1978. Other grocery chains soon followed suit, and the trend picked up steam when big-box retailers, like Walmart (WMT) and Target (TGT) jumped into the grocery market with their own branded products. So-called "supercenters" made up 27% of the grocery market in 2009, up from 22% in 2005, according to Arlington, Va.-based Food Marketing Institute. Meanwhile, grocery chains like Trader Joe's took cues from the grocery industry in Western Europe, where store brands make up almost twice as much of the market as in the U.S., and expanded into a wide range of self-branded food products. Along the way, private-label brands appeared to have shed much of their budget stigma. More than two-thirds of those who participated in Nielsen's U.S. survey said they thought private-label goods had the same or better quality than name brands. And just 10% said such products weren't suitable "when quality matters," although 17% indicated that private-label brands have "cheap-looking packaging." The few packaging and quality concerns are unlikely to deter customers in the future, even if the economy continues to improve and gives more families the luxury of returning to better-known -- and often pricier -- brands. More than nine in 10 Americans surveyed by Nielsen said they would continue buying private-label brands even if the economy improves. "Whoever offered you a deal tended to win this last decade," Balzer says. "The majority of brands will still have to deal with how do to beat these private-label products even when all of this is done."